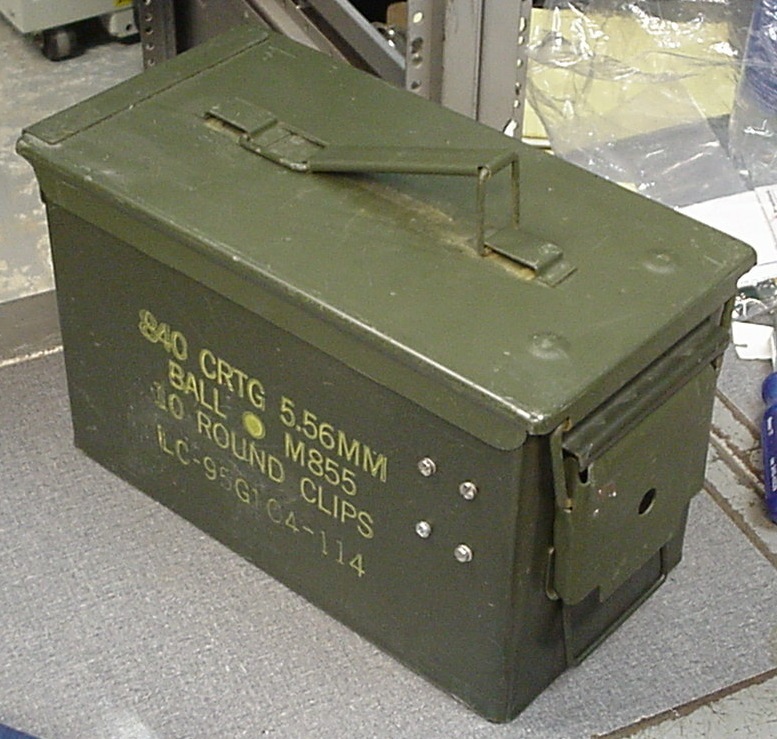 Everything fits neatly inside a regular surplus ammo can. 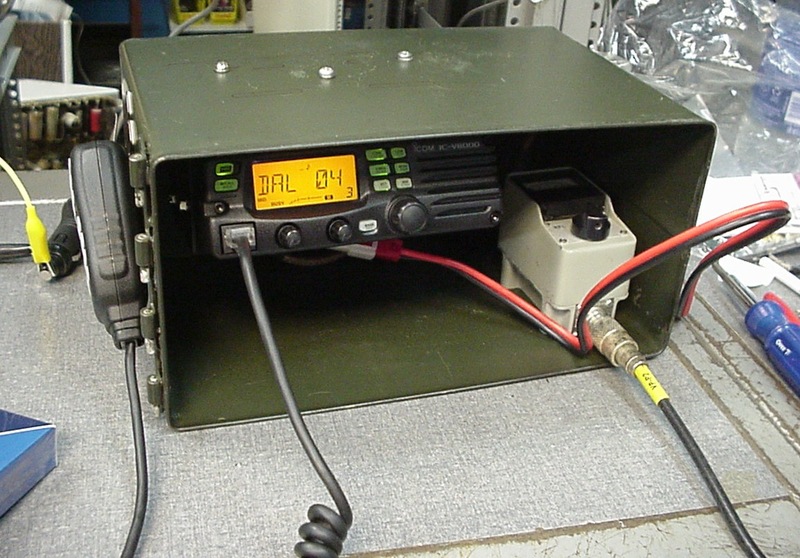 Ammo cans are shallow for most full size mobile radios, so the 6" deep radio was mounted at an angle to let the knobs clear the lid when shut. A 90-degree adapter was used for the RF cable connection on the back. 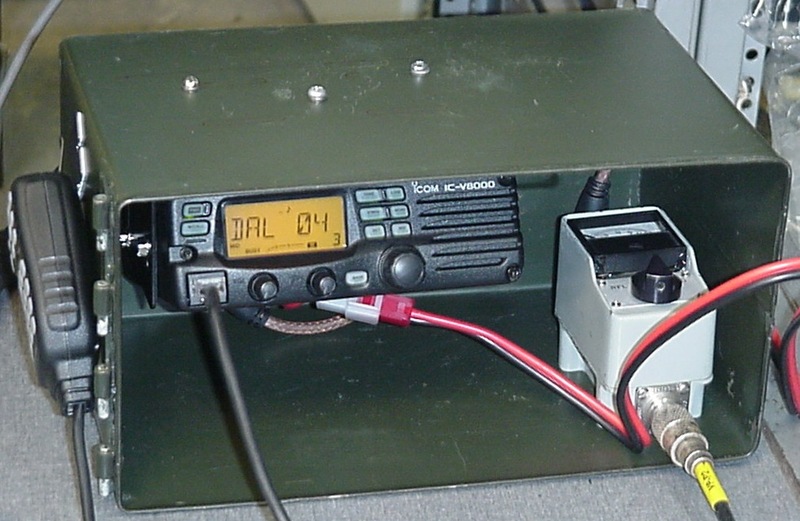 Several radio models can be used, but check the dimensions first or you'll end up with a can that won't shut! Once the job is done, everything fits inside neatly, including a small Bird FWD and REV power meter which happened to be on hand. The meter has four small threaded holes in the bottom of the case, and these were used to attach the meter to the bottom wall of the can with screws. A larger/deeper can could have been used, but something was needed that could be placed on the transmission hump of a Ford Crown Victoria and still allow the ashtray/cup-holder to be opened. The ashtray assembly, when opened, also helps hold the can in place. Later, a hinge will be added to the bottom of the can (bottom as in the orientation shown below -the 'operating position' -the sides of the can will be referred to as the can is shown in the picture below.) with a bracket or 'tang' which will unfold and slide in between the halves of the bench seat and help hold the can in place. A thin but lengthy hinge would be good here. The idea is for it to be removable easily to prevent theft or to take it and use it outside of the vehicle. In order to get enough of an angle to clear the volume and squelch knobs as well as the 90-degree PL259-to-SO239 adapter, the radio mounting bracket was modified to permit a more extreme angle of tilt. Most of these brackets have several holes and a slot so the angle can be adjusted. On this one, which has a slot and a hole on each side, an extra hole was drilled on each side above the original hole, so that the radio could be tilted enough to 'shorten' it to clear the can. Doing this resulted in the bracket touching the top of the radio just behind the front panel. This means that the bracket could not then be mounted directly to the can top wall because the front panel would hit the wall before the bracket would fit flush. Three small (3/4" tall) threaded ceramic stand-offs left over from a vacuum tube project were used to space the bracket down from the top of the can as shown so that the front of the radio would clear the can's 'ceiling'. The radio has a fan on the back, and mounting it at an angle gives this some clearance so it can do its job. The picture with the flash helps show the inside. Also, note the provided microphone hanger was attached to the outside of the can in such a position that when the unit is sitting flat on a table, the mike is easy to get to. When in the car, it can just be put in the can or laid on the seat or cupholder. It can be seen that the radio is being powered by a cigarette lighter connector. The radio draws up to 15 amps, so be sure to get one than can handle the current. Radio Shack has a 15-amp one which comes with a 3-way socket as well. The manual advises not to use a cig lighter cord due to vehicle noise but there has been no problem with that or with the current drain on the 75-watt "high power" setting so far. Measured voltage at the radio was 13VDC with 13.5VDC at the lighter socket, and this is with the 15FT or so of DC wire supplied with the radio. It has not been cut to lengh yet, and with such a low voltage drop, there seems to be no reason to shorten it. Just make sure the socket can handle the current necessary for the radio. The radio can be put on low or medium to reduce power drain substantially in weaker electrical systems. Many operators use "Anderson power pole" connectors, so maybe these could be added inline for greater flexibility. 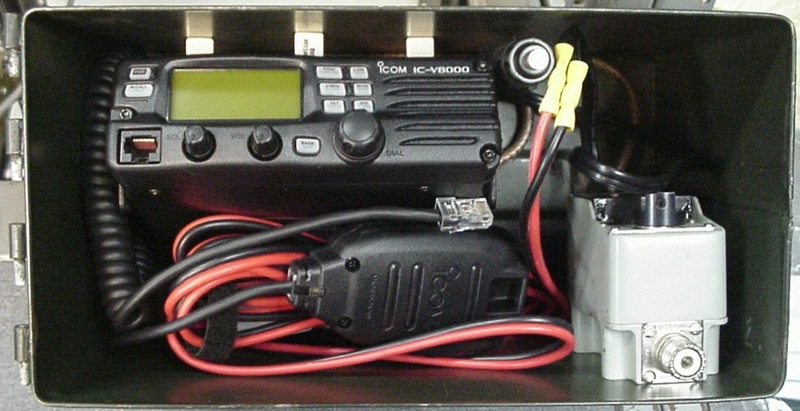 Radio Shack 2M; HTX-252 1.25" x 5.12" x 5.5"
The Icom IC-V8000 is a 2m FM mobile transceiver with 75 watts output. It has a switchable amber or green alphanumeric (6-character) LCD display, and features weather alert scan, DTCS and CTCSS tone encode/decode/scan, extended receive, optional DTMF paging and squelch, 207 memory channels, 10 24-digit DTMF autodialer memories, multiple scanning modes, and more. The radio is supplied with a fused DC power cord, mounting bracket with hardware and a backlit DTMF hand microphone with up/down frequency controls and programming buttons.